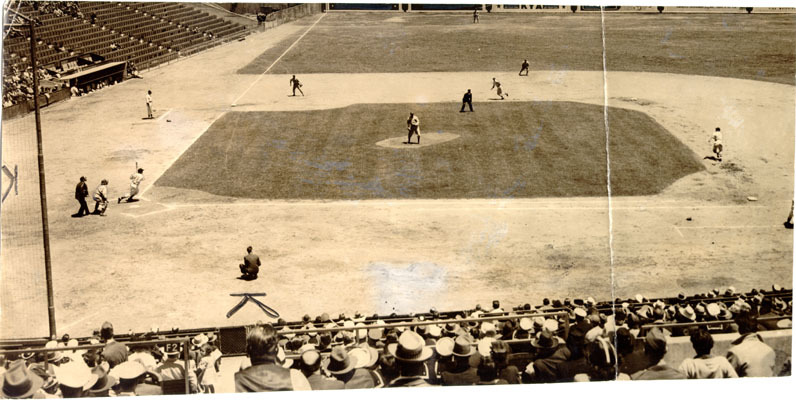 Title [San Francisco Seals playing at Seals Stadium] [graphic]. Description 1 photographic print: b&w. Reproduction Rights Permission to use this image must be obtained from the San Francisco History Center, San Francisco Public Library. Notes Newscopy: "Willie Enos, San Francisco's 'strong boy,' did yeoman's chores in the first game of yesterday's doubleheader in Seals Stadium with Hollywood, but his efforts went for naught when his mates lost the game by 6 to 4. Here's a sample of Willie's work as he raps out a triple off Roy Joiner to drive home Charlie Peterson, racing to third, and George Metkovich, heading for second, in the first frame. In the third he drove in the same pair with a single.". Subject Buildings -- California -- San Francisco. San Francisco (Calif.) -- Photographs. Source San Francisco Call Bulletin.